AP computer science exam lasts for 3 hours and it has two sections, multiple choice questions, and free response section. Section 1: Multiple choice sections have 40 questions and it lasts for 75 minutes, and score 50% of your score. Section 2: Free response section has 4 questions and lasts up to 105 minutes. You need hand writes the code on a piece of paper. You cannot compile and run it using a computer. Ace your AP computer science exam with this easy to follow study guide. 5 steps to a 5 are the best AP computer science exam prep book that will help you to score a 5 with easy to follow 5 steps study plan. If you want to develop test-taking skill, knowledge, and confidence then this 5 steps to a 5 are the best AP exam prep book you should have. This most popular test prep guide matches the latest course syllabus and the latest exam. The book offers you 2 full-length practice tests with the detailed answer to each question and much more. Customization and interactive AP planner helps you to organize your time. Powerful analytics that will assess your test readiness. Note: New version of the 5 steps to a 5 best AP book is available and if you want it then checks it now on Amazon. Well organized book with good information. The great online app helps to study for AP exam. The comprehensive test prep guide has great content for AP computer science book. This detailed manual guide offers the 3 practice tests for the level A course that includes a diagnostic test, subject reviews, detailed test topics and all the question answer with explanation. Even more, the practice exam contains new questions that will reflect the new free-response style used on 2012 AP exam. 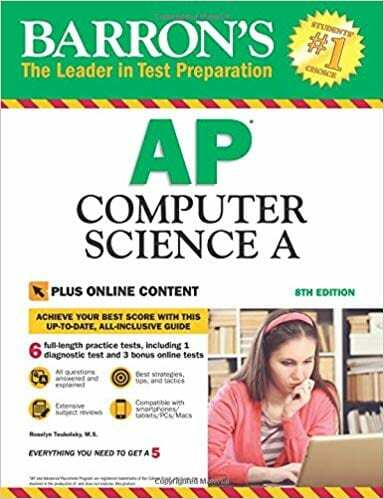 Additionally, two-dimensional arrays are given for extra practice plus bonus practice tests given with this best AP computer science book. The additional full-length practice test offered with this book has all the questions answer with full explanation. Affordable price, worth the money. The book is not good for the beginners. Good practice tests but not enough practice tests. Now, after reading the review of the best AP computer science book hopefully, you will be able to choose the right AP exam preparation book for you. If you still confused which book is good for you then check our expert's recommendation. If you want the book that has enough number of practice test with easy to understand the content structure of the book then 5 Steps to a 5: AP Computer Science A 2019 is the best book you should have. And if you want the affordable book with the least number of practice test then Barron's AP Computer Science A, 8th Edition is the best affordable and comprehensive book for you. So decide which kind of book you want and start preparing for your AP computer science exam. All the best for your exam and have a great reading time.